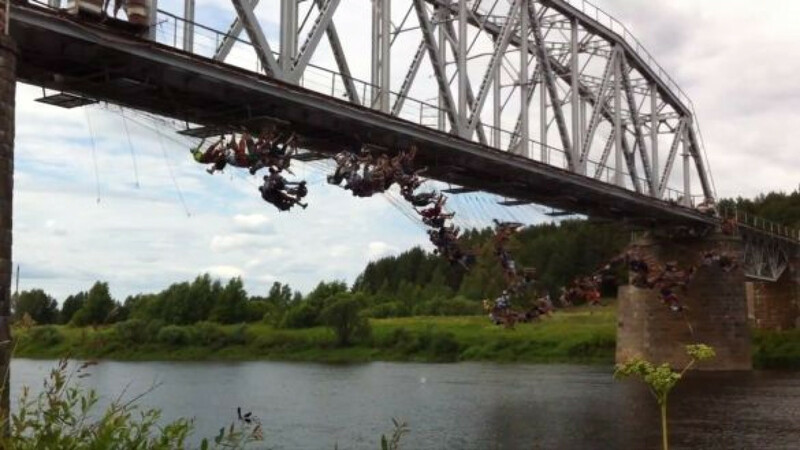 Rope jumpers leaping from a Tver region bridge in early July. Vladivostok police have charged a group of extreme rope-jumpers with violating rules for holding public gatherings, a news report said Monday. "They've summoned me to court for organizing jumps," Vasily Karpyuk, a member of the group, told Interfax. "What's more, we had just gathered with friends to jump, but they're charging me with organizing a public event. We live in wonderful times, comrades!" Karpyuk said. Karpyuk said he had placed ads for a rope-jumping training session on social-networking sites and that television crews had turned up with cameras, since this was the first time the activity would be done in the city. The sport involves jumping from a high point, such as a bridge or a cliff, while attached to a rope, causing the leaper to fall to the rope's end and then swing back and forth from the momentum gathered during the drop. But local police apparently objected to their activity, issuing the group a summons to the police station to answer charges of organizing an event without authorities' prior permission, Interfax reported. Karpyuk and others now face a fine of between 10,000 and 20,000 rubles ($310 to $620) or mandatory community service. Under legislation passed last month, penalties were increased for holding unsanctioned public gatherings. The law has been widely viewed as part of a Kremlin crackdown on opposition activity following mass anti-Kremlin protests that began in December. The extreme athletes are not the first to be penalized under the new rules. On June 14, organizers were forced to cancel a yearly bike ride in Murmansk after police warned them that they could face punishment for not requesting authorization in advance. Roughly two weeks later, St. Petersburg police broke up an event commemorating pop icon Michael Jackson near the U.S. Consulate, citing the same law.